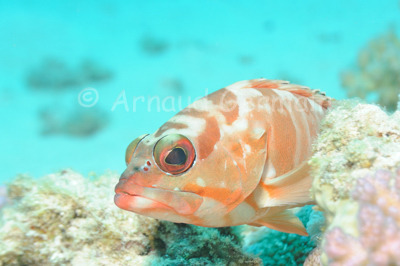 In Marsa Shagra, the blacktip grouper is a common species. These medium sized predators just lie on top of some coral outcrop, waiting for an unsuspecting fish to swim by. They are not that shy, so if you approach slowly, you can get close to take pictures. Nikon D700, Nikon 28-105 mm macro at 28mm, F8, 1/250th, ISO 400, Ikelite Housing and Ikelite DS160 strobe set on TTL.